To get a good deal from your metal scrap recycling centre, it important to keep up with market news, price changes, and other things that can affect your profits at the scrap centre. However, it is also important to know and remember the tricks of this trade that can help you earn more and master the trade. Read on to discover some. This is fundamental. It is one of the most important tests you should do using a magnet. A magnet helps you sort ferrous metals from the non-ferrous ones. If a metal sticks to the magnet, know that it is a ferrous type such as iron and steel. If the metal does not stick, it is a non-ferrous type like copper and brass. Insight- Non-ferrous metals are worth more cash than ferrous metals. Whenever you find it difficult to identify the type of the metal, use a metal file. Use it to file down coated items like wires to determine the metal type. It is very useful to determine things that contain copper and brass. For instance, you will find some pipes tarnished or stained. In such cases, use a metal file and you will be able to see the true color of the metal. For example, reddish color represents copper and yellow represents brass. Similarly use a metal file to decode the materials of different types of wire. For example, silver represents aluminum, while a reddish hue represents copper. All are aware about the shops from where they can buy home appliances. However, not many know how they can treat the appliances once redundant. Here are some common queries answered. 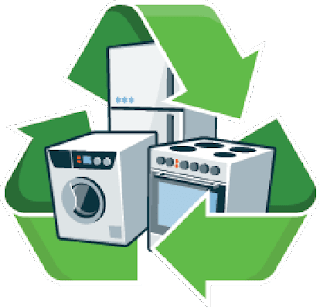 What should I do with old appliances that are no more worth repairable? The best place to take your redundant appliances to is a metal recycling centre. In this way you can get rid of those old appliances that provide no outcome and only take up space in your home or garage. Moreover, you get money in exchange of these appliances which can be used to invest in buying new appliances. Do all metal scrap recycling centres accept all types of appliances? Apparently, every metal scrap recycling centre has its own terms and conditions making it difficult to carry all types of appliances to a particular centre. For instance, some companies charge extra on generating things like fridge, air conditioning unit, or even plastic dish washers. They are apparently new additions for some metal scrap recycling companies. Hence, before carrying your pile of metal scrap do check in advance whether the company will accept it or not and what are the company’s underlying terms and conditions. When investing further in overhaul of old appliances seems worthless, you will think of visiting perhaps a used appliance dealer. However, taking the old appliances to metal scrap recycling centres is the most cost effective option available today. We recycle ferrous and non-ferrous Scrap Metal in Qatar. Contact us to get optimal rates for your scrap metals.